– Lexus highlights that the new LS offers more of a “coupe-like silhouette” while being longer, lower and wider than the previous model. 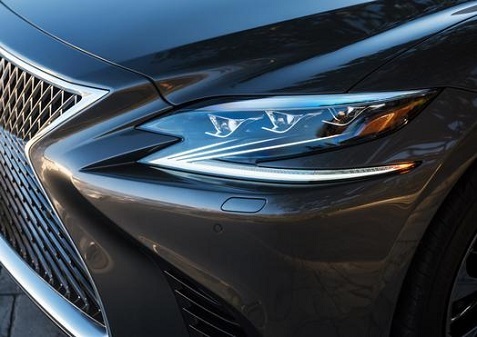 Lexus became more aggressive in its design language several years ago with the front spindle grille, and that’s prominently featured here as well. Take a look at the photos above for a good look at the new design. – The new LS is built with Lexus’s all-new global architecture for luxury vehicles (GA–L), their rear-wheel drive platform that’s an extended version of the one used for the impressive new Lexus LC 500 coupe. – Lexus has replaced the V8 from the previous model with an all-new 3.5-liter V6 engine with new twin turbos developed through the company’s F1 technology. The goal is to offer V8-level power without sacrificing fuel economy and also minimizing noise and vibration. The result is an output of 415 horsepower and 442 lb-ft of torque, which offers gains over the current LS model’s V8. The new LS also features a 10-speed automatic transmission that debuted in the Lexus LC 500. As you might expect, this new LS will also be packed with new luxury and comfort features in the cabin, as well for the driver and all passengers. I’m definitely looking forward to driving this one!